I’ve written often about Christopher Hitchens, the world’s most prominent atheist. Most recently, I did a piece on the CNN blog, urging Christians to pray for Hitchens as he battles a very serious form of cancer—and to my astonishment, this benign recommendation was met with an extraordinarily negative reaction from atheists. But that’s a story for another day. On my recent vacation, I took two books with me, Christopher Hitchens’s memoir Hitch-22, which I had begun and wanted to finish, and his brother Peter Hitchens’s The Rage Against God: How Atheism Led Me to Faith, a stunning account of the younger Hitchens’s journey through militant Trotskyite atheism to a robust Christianity. 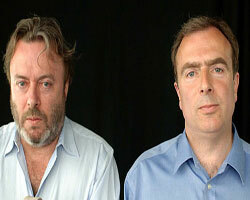 It was a fascinating, and I must admit rather unnerving, experience to overhear, as it were, the brothers Hitchens debating with one another in my own head. Things got so intense that Christopher Hitchens actually appeared in one of my dreams during the vacation! Whereas Christopher has a rather baroque literary style, his brother writes soberly and directly. His fundamental theme is this: though the atheists claim just the contrary, the collapse of Christianity carries in its wake dire consequences for civilization itself. Peter Hitchens was a foreign correspondant in Moscow during the waning years of the Soviet Union, and he experienced a culture in deep crisis. There was political corruption of every type on every level of the system; there was widespread drunkenness; abortions far outnumbered live births; and a suspension of common courtesies—exchanging common signs, holding doors, etc.—was everywhere in evidence. How does one begin to explain this almost total ethical collapse? Hitchens argues that it followed ineluctably from a conscious and brutally enforced Soviet policy in regard to religion. From the earliest days of the regime, that is to say, even before the rise of Stalin, the Soviet government launched a systematic attack on religion, especially Russian Orthodoxy. Priests and nuns were, in great numbers, put to death or arrested, and the few that were allowed to live were consistently harrassed, mocked, and humiliated. Furthermore, religion was constantly pilloried as “unscientific” and “backward,” the stuff of crude superstition and pre-modern mythology. And religious instruction was strictly disallowed in the educational system. In fact, it was routinely characterized as a form of child abuse, a poisoning of the minds of the young. Peter Hitchens suggests that there there is a clear causal relationship between this brutal anti-religious strategy and the civilizational breakdown that was universally on display in the Soviet Union by the early 1990’s. This is precisely because the moral matrix that one tends to take for granted is in fact a consequence of certain very basic religious convictions, including and especially, the belief in God as a guarantor of moral absolutes. Once God has been jettisoned, or at the very least marginalized, morality becomes relative. And once morality is relativized it devolves, finally, into a function of oppression, the behavioral system instituted by and for the powerful. Now what Peter Hitchens sees in the work of his brother and the other popular atheist writers—Sam Harris, Richard Dawkins, Daniel Dennett, etc.—is a tragic repeat of the Soviet program. All of the “new” atheists call for the elimination of religion as something poisonous; they all characterize it as “pre-scientific” and “superstitious;” and in perhaps the most damning parallel, they, to a person, descibe religious education as a species of child abuse. His conclusion is that this sort of aggression, though often presented as an enlightened strategy, would result in precisely the same kind of moral collapse that Hitchens witnessed in the Gorbachev era Soviet Union. The “new” atheists, he thinks, don’t realize that the very ethical principles that they point to with such vigor (Christopher, for example, is in a constant state of high dudgeon over any number of moral outrages around the world) are mortally threatened by an attack on God. Without a transcendent referent, morality becomes as vacillating and capricious as the human will itself. Christopher Hitchens and his colleagues, Peter argues, don’t see that, in making ethical appeals, they are implicitly accepting the very cultural matrix that they are explicitly trying to undermine. Peter Hitchens sees, in point of fact, some disturbing signs in our own western societies that the breakdown of religion is having just this ethically de-stabilizing effect. In a culture where an absolute and transcendentally grounded moral code has been jettisoned, “nursing has become less dedicated, wives more inclined to leave their babbling husbands in care homes to be looked after impersonally by paid strangers…and soldiers readier to save themselves while their comrades lie in pain within reach of the enemy.” Tradition morality, grounded in a keen sense of the divine command, called people consistently beyond themselves and their own desires, even when that call involved the total sacrifice of the self. Atheist morality devolves, almost inevitably, into a species of might makes right, the will of the stronger becoming the criterion of good and evil. We’ve all had ample opportunity these past several years to hear the reflections of Christopher Hitchens. I think it would be a fine idea indeed to listen now to his eloquent brother.